Think Fast - Is Neuromorphic Computing Set to Leap Forward? Think Fast – Is Neuromorphic Computing Set to Leap Forward? Steadily advancing neuromorphic computing technology has created high expectations for this fundamentally different approach to computing. Its strengths – like the human brain it attempts to mimic – are pattern recognition (space and time) and inference reasoning. Advocates say it will also be possible to compute at much lower power than current paradigms. At ISC this year Karlheinz Meier, a physicist-turned-neuromorphic computing pioneer and a leader of the European Human Brain Project (HBP), gave an overview that served as both an update and primer. Meier is predictably bullish, citing the already proven power of deep learning and cognitive computing while still using traditional computer architectures by players like Google, Baidu, IBM, and Facebook. Indeed, computer-based neural networking isn’t new. It’s a mainstay in a wide variety of applications, typically assisted by one or another type of accelerator (GPU, FPGA, etc). Notably, NVIDIA launched its ‘purpose-built’ deep learning development server this year, basically an all GPU machine. Many of these cognitive computing/deep learning efforts on traditional machines are quite impressive. Google’s AlphaGo algorithm from subsidiary DeepMind handily beat the world Go champion this year. But simply adapting neural networking to traditional to von Newmann architectures has drawbacks. One is power – not that it’s bad by conventional standards – but it shows no sign of the being able to approach the tiny 20W or so requirement for the human brain versus megawatts per year for supercomputers. Let’s acknowledge the training problem persists in neuromorphic computing as well. That said, neuromorphic, or brain inspired, computing seeks to mimic more directly how the human brain works. In the brain, neurons, the key components of brain processing, are connected in a vast network of networks. Individual neurons typically act in what’s called an integrate-and-fire fashion – that’s when the neuron’s membrane potential reaches a threshold and suddenly fires. Reaching that potential may involve numerous synaptic inputs that together sum to cross the firing threshold. One of the staggering aspects of the brain is the range of physical size and ‘event’ durations it encompasses. In rough terms from tiny synapses to the whole brain there are seven orders of spatial magnitude, noted Meier, and in terms of time there are eleven orders of magnitude spanning activities from neuron firing to long-term learning. “Typically brains consist of neurons that spike and produce these kinds of action potentials, which are at the millisecond or sub millisecond level. And as you all know the time to learn things is months to years,” he said. There have been successful efforts to map neural networks onto a supercomputer. One such effort on Japan’s K computer deployed a relatively simple network (~ one percent of the brain) and ran 1500X slower than the brain. This early work on the K computer by Markus Diesmann, another leader in European Human Brain Project (HPB), was the largest neural net simulation to date and an impressive achievement. However, it was a far cry from the efficiency (energy or processing capability) of the human brain. IBM’s TrueNorth uses the TrueNorth chip implemented in CMOS. 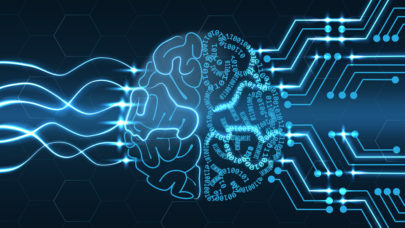 Since memory, computation, and communication are handled in each of the 4096 neurosynaptic cores, TrueNorth circumvents the von-Neumann-architecture bottlenecks and is very energy-efficient, consuming 70 milliwatts, about 1/10,000th the power density of conventional microprocessors. This spring IBM announced a collaboration with Lawrence Livermore National Laboratory in which it will provide a scalable TrueNorth platform expected to process the equivalent of 16 million neurons and 4 billion synapses and consume the energy equivalent of a hearing aid battery – a mere 2.5 watts of power. The SpiNNaker project, run by Steve Furber, one of the inventors of the ARM architecture and a researcher at the University of Manchester, has roughly 500K arm processors. It’s a digital processor approach. The reason for selecting ARM, said Meier, is that ARM cores are cheap, at least if you make them very simple (integer operation). The challenge is to overcome scaling required. “Steve implemented a router on each of his chips, which is able to very efficiently communicate, action potentials called spikes, between individual arm processors,” said Meier. SpiNNaker’s bidirectional links to between chips is a distinguishing feature – think of it as a mini Internet, optimized to transmit ‘biological signal spikes, said Meier. The SpiNNaker architecture acts well as a real time simulator. The BrainScaleS machine effort, led by Meier, “makes physical models of cell neurons and synapses. Of course we are not using a biological substrate. We use CMOS. Technically it’s a mixed CMOS signal approach. In reality is it pretty much how the real brain operates. The big thing is you can automatically scale this by adding synapses. When it is running you can change the parameters,” he said. It’s a local analogue computing approach with four million neurons and one billion synapses – binary, asynchronous communication. Training the networks – basically programming an application – remains a challenge for all the machines. In essence, the problem and solutions become baked into the structure of the network with training. In the brain this occurs via synaptic plasticity in which the connections (synapses) between neurons are strengthened or weakened based on experience. Neuromorphic computing emulates learning and synaptic plasticity through a variety of techniques. In his ISC presentation, Meier walked through three examples of neural networks and their training: deterministic supervised; deterministic unsupervised; and stochastic supervised. “Most of the neural networks in use today are deterministic. You have an input and output pattern, and they are linked by the network – [in other words] if you repeat the experiment you will always get the same result. Of course the configuration of a network has to happen through learning,” said Meier. The supervision involves telling the computer, during learning, whether it has made a right or wrong choice. You can also have stochastic networks: “You say that reality is a distributions of patterns. What you do in your networks is store a stochastic distribution of patterns, which reflect your prior knowledge, and which is acquired through learning. You can use those stored patterns either to generate distributions without any input or you can do inference,” he explained. Taking an example from nature, Meier showed an instance of deterministic supervised learning in which a neural network mimics an insect’s natural ability to uses its chemical sensors to distinguish between different flowers. “These are circuits that we reverse engineered using neuroscience,” he explained. “We have receptor neurons that respond to certain chemical substances and you have a layer, called a de-correlation layer, which is basically contrast enhancement. You see that in all perceptive systems in biology. On the right side you see association layer to take combined inputs and make a decision based on what kind of flower you have,” said Meier. It’s basically a data classification exercise. “The trick is to configure the links between those the de-correlation and association layers and this is done by supervised learning (telling the machine if it is correct or incorrect), through things like back propagation, Monte Carlo techniques, you really have to configure the synaptic link. Does it work? Actually it works very nicely,” said Meier. As an example of unsupervised deterministic learning, Meier reviewed how owls find prey in the dark. In biology the model is very straightforward. “Since the mouse is on the right side, it is a short flight path for the sound to right ear and a long path to the left ear. [Detecting this is] is done by a circuit encoding compensating for the short path in air by a long path in the brain. You depict the time coincidence between two input impulses to produce a stronger signal and that is done in a completely unsupervised way,” said Meier. This neural net is fairly straightforward to implement in hardware. Do you see a duck or a rabbit in the image shown here? It could be a duck or a rabbit but you only see one at a given moment. If you are wondering how a spiking vector be a variable, Meier said, “We have developed a theory [in which] zeros and one are presented by neurons that is either active or in a refractory state. The probability that this network converges to a target is a Boltzmann distribution,” said Meier. “Here of course it is a neural network where we are connecting weights between neurons. How do you train these things? There is a very well established mechanism where you clamp the visible unit of the input layer to the value of a particular pattern and then you weight the interaction between any two nodes. This is the learning process but it’s slow,” said Meier. While a great deal of progress in neuromorphic computing has been accomplished, thorny issues remain. For example, it’s still not clear what the base technology should be – CMOS chips, wafer scale lithographic ‘emulations’ of neurons, etc. – and more options are on the horizon. IBM recently published a paper around phase-change memristor technology that shows promise. The wafer scale integration used for BrainScaleS is probably the most novel and brain-like approach so far. During the post-presentation discussion, questions arose around process and device variability and degradation issues for various technologies. Challenges aside, the IBM-LLNL project and two European systems should help accelerate neuromorphic development. Meier notes that access to SpiNNaker and BrainScaleS is not restricted to Europeans although restrictions for some countries exist due to national technology export law. For information on SpiNNaker contact Furber at the University of Manchester, U.K.
Software tools to configure and control the systems are described in the Neuromorphic Guidebook. “Clearly the machines we are building at the moment are research devices but they have one important feature, they are really extremely configurable. In particular you can also read out the activity of network because you want to understand what is going on,” said Meier. This will change when putting neuromorphic systems into real-world practice. One issue is implementaing local learning (on chip) when the device is in the field, enabling the system to adapt to changing environments. It would open up a new range of applications, agreed Meier, “There’s a study under way now looking at how a car engine changes all the time, its performance changes, and you always want to optimize the efficiency of the engine. It would be really nice to have these local learning capabilities on chip on the system in the field being applied.” There are no technical barriers in theory he said, but still missing technology components.